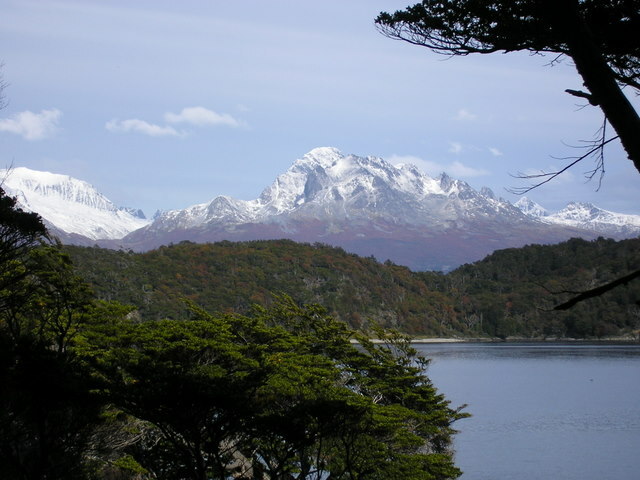 Ushuaia (“ush WHY a”), Tierra del Fuego. As the plane breaks through several layers of clouds, a dramatic sight comes into view. The southern most range of the Andes Mountains border the Beagle Channel on both sides. The jet glides within the ridges of snow capped jagged summits. Low clouds, like smoke rings, encircle a few peaks on the southern side of the Channel. Ushuaia, low, small and looking insignificant, hugs the lower portion of the Martial range fanning out along the Channel on a sliver of flat land. A small peninsula of land juts into the Beagle Channel holding the runway of Malvinas Airport. The jet makes a tight circle, the mountains close enough to touch, and descends quickly. The landing at Ushuaia is dramatic. Being asked by Argentine agricultural agents to open my bags was unexpected but a reminder that this archipelago at the base of the Western Hemisphere is a protected natural treasure of both Argentina and Chile. It is home to a vast array of animal and plant life. As a vacation playground tourism comprises a large segment of the economy and tens of thousands of visitors poses dangers to this environment. It’s a delicate balance. International boundaries were not settled between Argentina and Chile until 1985. Ushuaia became the capital of a reorganized government - Provincia de Tierra del Fuego, Antartida et Islas del Atlantico Sur. Of course this includes several island groups, Malvinas/Falklands being just one, which England controls, and the Antarctic Peninsula, for which Argentine sovereignty is not internationally recognized. In Chile, Punta Arenas became the capital of Patagonia Sur et Islas Magallanes but claims part of Antarctica as well - actually some of the same peninsula as Argentina. (Both nations abide by international treaties concerning accepted activities on that continent.) But let’s not confuse nationalism with tourism. Regularly scheduled flights to British controlled Malvinas/Falklands leave from the Chilean side of the Fuegian archipelago and cruise ships sail out of Buenos Aires. The attraction of Tierra del Fuego and Patagonia Sur is certainly not the politics, especially for the thousands of Argentines and Chileans that vacation here year round, nor for the thousands of Brazilians, Columbians, Australians, New Zealanders, French, English, Spanish, Italians, Germans, Dutch, Israelis, Canadians, Americans, Japanese and an ever increasing number of foreign students trekking through its awesome wilderness. The pristine beauty of the mountains can be enjoyed only a few miles from Ushuaia on Cerro Martial. A variety of tour boats accommodating intimate groups of 8 to many dozens will provide excellent instruction for the visitor on Tierra del Fuego’s unique flora, fauna, animal life and the Beagle Channel. In Parque Nacional Tierra del Fuego good trails allow even older visitors to explore this unique environment. On the Chilean side there’s the legendary Strait of Magellan with its commercial port of Punta Arenas. Further west is the village of Puerto Natales, gateway to the magnificent Parque Nacional Torre del Paine. Anglers can express their passion and relax in luxury at lodges and estancias in many areas of the archipelago. Seafarers can explore the Chilean fjords, round infamous Cape Horn and, in the summer season, sail to the last continent, Antarctica. History and anthropology enthusiasts can research the tragic end of indigenous cultures that well meaning missionaries attempted to “civilize” yet could not protect from disease and extinction. Shoppers can fill their bags with duty free items and everyone will discover a wide variety of comfortable accommodations and Ushuaian restaurants for all tastes and budgets. The end of the world is just the beginning of excellent adventures!